The GL622 is a dual grade laser. Both are rugged, automatic self-leveling lasers featuring grade capability of ± 25% and can be used in a wide variety of grading, excavating and alignment applications by general and specialty contractors. The GL622 include the RC602 full-function radio remote control which offers advanced automatic features like Grade Match, PlaneLok and Automatic Axis Alignment. The remote as well as the transmitters have an intuitive graphic display which is back-lit for ease of viewing. Contractors can do everything with the remote control that they can do at the laser keypad, up to 100 meters (330 feet) away—even from the cab of a machine. The ability to make grade changes remotely can significantly reduce setup time and speed operations. The GL622 Grade Lasers self-plumb in the vertical position to allow an even wider range of applications such as such as anchor bolt installation, form, tilt up, and curtain wall plumbing. With its rugged design, the GL612/622 Grade Lasers can survive a drop of up to 1 meter (3 feet) on concrete. 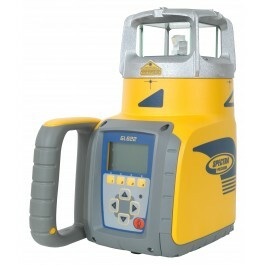 The laser also features IP67 moisture and dust sealing to handle the tough construction environment. The GL622 Grade Lasers retains all well accept functions of the GL500 series lasers with additional advanced features and benefits offering much more versatilities.